Thanks to everyone who came to Loudhailer Acoustic last night, it was a lovely evening. There were lots of fantastic new songs and poems, a few nods of the head to the 80s and at least two clean shaven surprises. Rich & I opened the show with something new that we have in mind for the Loudhailer Electric Company followed by Catherine Scott’s awesome trio which included two brand new poems, a smattering of suitably bad language & politics and lots of laughs from the audience. Gifford Rolfe’s title track from his upcoming album Words in Black and White was another of his classics followed by a beautiful dedication to his oldest fan. He was joined by Joan Foye on vocals for a great sounding Americana finale. The Brummie bard of Snaith, Roy Kibbler created a wave of smiling faces with his pop quiz poem & summer of love nostalgia before creating an audience discussion about Clootie trees, walls and wells. Not only entertaining, but enlightening. Graham Graham Beck and his Gramahaha closed the first half with a fabulous performance. Despite being afflicted by a trio of unrelated injuries his 80s song Glamour Girl, originally written for his band Penguin Fury was a treat. 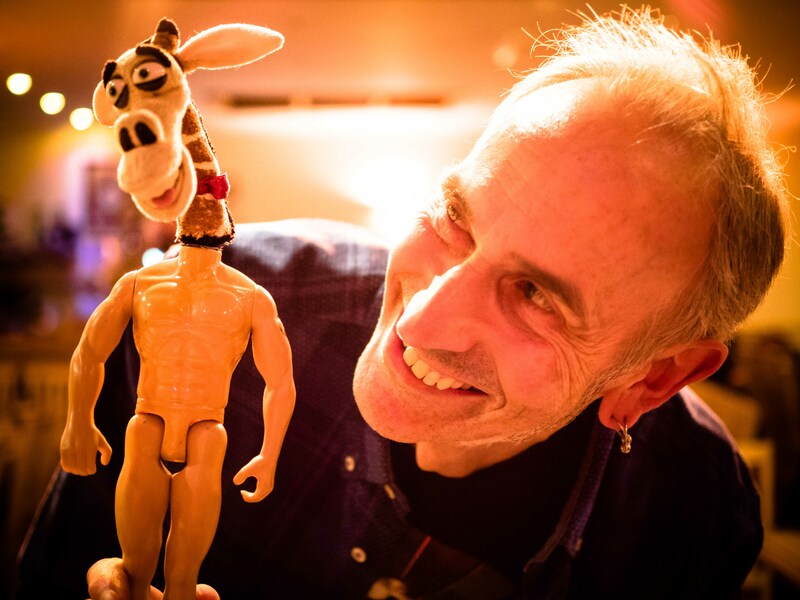 Graham closed his show with the wonderfully strange brand new techno/baroque song – Action Man with a Giraffe’s Head. His performance was complete with a GGB style prop, yes, that’s Action Man with the head of a giraffe. Break time drinks and chat before Karl Oakes opened the second half in top voice and his inimitable style with three ace brand new songs. A first time welcome to Loudhailer Acoustic next for East Coast poet Richard Harries who entertained us with a fantastical reimagining of Cinderella and Eileen’s excellent memory. Next up, the best blues harp blower around, Brian Williams, played a fabulous foot stomping set of songs of varying religious persuasions – from gospel to Rev. Elder Roma via Tom Waits, what a superb sound! We were delighted to welcome back, from Pickering, Phil Friend with a lovely English folk sound and three beautiful songs and stories of friends, countryside and English Rosedale blues. To close the show Ruth Scott was in fine voice for a set of Late Night Marauders jazz blues originals with Ben Saville on keys – what an eclectic evening it was! 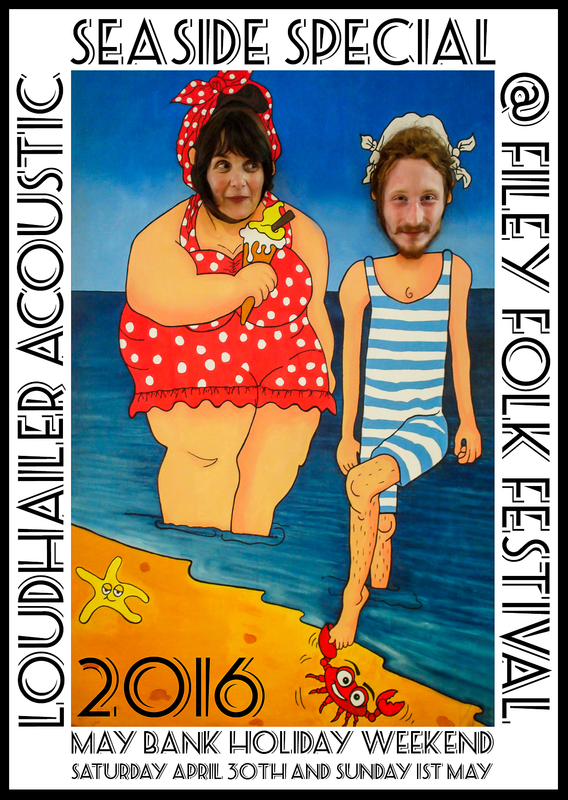 Coming up next, Loudhailer Seaside Special at Filey Folk Festival on the bank holiday weekend Saturday 30th April and Sunday 1st May 2016 at the Masonic Hall, 12.00 pm til 10.30 pm. It would be great to see you there. There is lots going on over the weekend at various venues. Our venue, Filey Masonic Hall is at 27 Rutland Street, Filey, North Yorkshire, YO14 9JA (just round the corner from The Belle Vue). 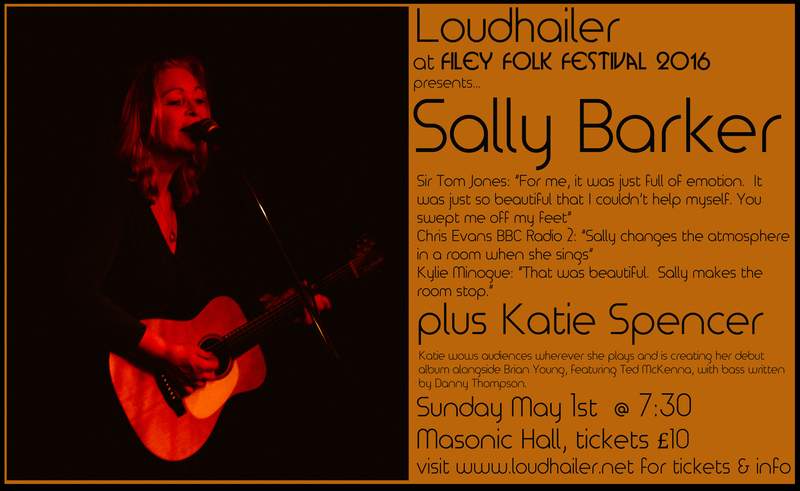 There will be two afternoons of acoustic music and we are delighted that the superb folk singer and The Voice finalist Sally Barker will play a ticketed Loudhailer gig on Sunday May 1st, 7.30 pm. The fabulous Katie Spencer and guest Robert Peirson will support Sally. Tickets £10 + booking fee available online. Click here to buy tickets. Loudhailer Afternoons: There will be two afternoons of acoustic music on Saturday 30th April and Sunday 1st May between 12.00 pm – 5.00 pm both days. They will be all acoustic afternoons with cabaret style candlelit tables, a bar, tea, coffee, and the same great vibe as our Loudhailer Acoustic nights – but with booked performers. There will be a fabulous range of acoustic music & spoken word from a host of superb players, all doing something special for the Loudhailer stage that you won’t see anywhere else! There will be a small cover charge – £3 on the door – which includes a free festival programme. Bring your friends and family and hang out for the afternoon. You can bring a picnic (but no need to bring alcohol, there is a bar there). It’s a family friendly venue and we’re really looking forward to it! 12.00 pm: Doors Open – refreshments available. 12.45 pm: Rich & Lou’s Showstarter – let’s get the show on the road! 1.00 pm: Dodge McKay – cool and beautiful folk songs from Belfast songwriter whose stunning new album addresses love, loss, memory and desire with a tuneful, poetic finesse and emotional precision. 1.30 pm: Catherine Scott – Catherine is a wickedly witty performance poet who tells a down to earth look at life and has a captivating and engaging repartee. 2.00 pm: Graham Brady – Graham’s fabulous classy songs tell edgy dark side stories, countered by infectiously catchy and dancey rhythms. 2.30 pm: Gifford Rolfe, Joan Foye and Roy Kibbler – superb northern England songs with a touch of Americana from Gifford and Joan segue into Roy’s astute word-smithery, a mix of fun, politics and observations of life. A whole show within the show. 3.15 pm: Brian Williams – stomp, whoop and holler with the amazing blues harp wizz and his one man band of spoons, bones and washboard. 3.45 pm: Jackson D – hugely entertaining psyche Goth blues with the coolest cats around. 4.15 pm: The Dark Secrets Unplugged – the premiere of Loudhailer regular, Jeff Parsons’ full four piece band unplugged set, showcasing brand new album, Band of Brothers. 12.45 pm: Rich and Lou’s Showstarter – kick out the jams brothers and sisters. 1.00 pm: The Ramshackle Shantymen – festival folk featuring the founder of Filey Folk Festival, the guy who started it all off. 1.30 pm: Dez Allenby plays Forest – original member of the legendary English acid folk trio Forest – contemporaries of The Watersons in the ’60s and out psyching the Incredible String Band in the ’70s. Dez’s set will include Forest songs played on bouzouki, English concertina, harmonica, percussion, whistles, and Indian shruti box, and a special guest. 2.15 pm: Alyx Tamminen – gritty spoken word from talented young performance poet. 2.30 pm: Jim Orwin – superbly crafted songs of life in Hull, from the Boulevard Boys to Gypsyville Girls – classic songwriting at its very best. 3.00 pm: Emily Pepsi Thomson – premiering new songs especially for Loudhailer at Filey, Emily has a beautiful clear voice and enchanting presence. 3.30 pm: The Graham Graham Beck Duo –“Honkytonkin” – alternative set of GGB’s spacey songs – never seen like this before – on acoustic piano with percussionist. 4.00 pm: Work in Progress – party time! Brilliant band with Cowboy DC at the helm and the best feel good Bluegrass sounds around. Sally Barker reduced Tom Jones, and viewers alike, to tears with her flawless performances on BBC’s ‘The Voice’. Whether she is singing to seven million on TV or to 70 people in a club Sally is the consummate professional. It is in live performance that Sally thrives and excels. She has the ability to lift the words off the page as if you were hearing them for the first time, revealing their true meaning. A seasoned performer, Sally has recorded six solo albums, with song writing influences from folk, jazz, blues and soul, and is well respected for her work with all-female folk group The Poozies. Sally’s years of touring have included countless support slots; Bob Dylan, Robert Plant and Sir Tom amongst them. Sally remains fiercely independent and true to her craft as she is set to present songs from her new ‘Love Rat’ ep alongside those from albums ‘Maid in England’, ‘Another Train’ and YouTube favourites ‘Dear Darlin’ and ‘To Love Somebody’ – a truly captivating performer as much at home in a folk club as on national television. To open the evening show Katie Spencer will be joined by Robert Peirson on fretless bass – heartfelt original songs beautifully played by the mesmerising singer songwriter and guest.